Block out the month of May in your diary! The Big Chocolate Tea Party needs you! The setting was the glamorous Grosvenor House, the occasion a chocolate afternoon tea party hosted by Paul A Young and Sian Lloyd. What was not to like! It was indeed a heavenly afternoon of cakes and conversation. But the reason for the event, the message we were there to hear, has stayed with me far longer than the memory of those delicious freshly baked buttermilk scones slathered in clotted cream and Paul’s salted caramel. And believe me that is a memory that is hard to dislodge. The Big Chocolate Tea Party, whose campaign was launched at our spectacular tea, is an annual initiative on behalf of The Sick Children’s Trust. During the month of May, up and down the country, TBCTP wants as many of us as possibly can, to get together, indulge in some tea and chocolate cake, and raise money for a charity supporting the families of critically ill children. 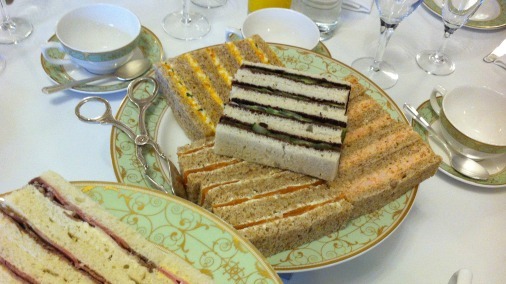 Sandwiches, chocolate afternoon tea style. Over finger sandwiches, including some with Venezuelan chocolate and cucumber, Paul told us about The Sick Children’s Trust. An ambassador for the campaign, with impeccable chocolate credentials, Paul is also Vice President of the charity. The idea behind The Sick Children’s Trust is simple, to assist the recovery of critically ill children by supporting their whole family while in crisis. What this means in practice is giving the families a place to meet and stay near to their child’s hospital bed. In an extraordinarily eloquent film, that had me with shivers down my spine and ‘there but for the grace of God go I’ rolling around in my head, we heard from those most profoundly affected. The father of a paralysed daughter, with older sons at home, told us how he had an eighty mile round trip to the paediatric hospital treating his little. Without the retreat and respite provided by one of SCT’s houses, or ‘homes from home’ he would be impossibly split, between car, bedside, and little else. 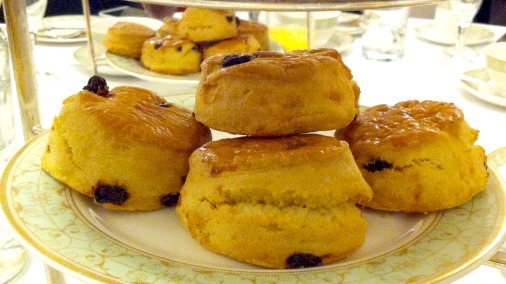 There were scones as far as the eye could see. 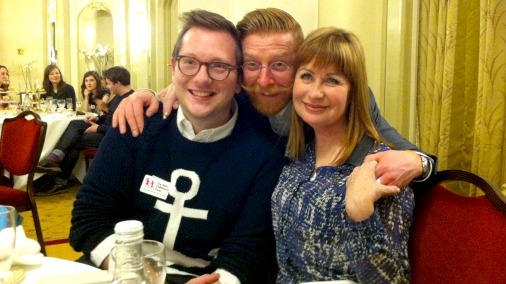 We were honoured to have Victoria Phillips with us at Grosvenor House. Her seventeen year old daughter is hospital bound. She has been able to stay near her bedside, been able to visit during the moments when it is most needed, which painfully are often in the middle of the night. Each of the ten houses that SCT maintains is within five minutes of one of the major paediatric hospitals, making it as easy as possible for parents to be nearby at all times. The houses also provide a place for the whole family to stay and meet, for homework to be done, for laundry, for meals to be made, for a touch of normality. And, as Victoria so poignantly put it, it gave her a place to breathe, to sleep, to have a cry. And thereby, no doubt, to recharge in order to do that which is beyond duty, to continue to be there for her beloved girl. Mine, all mine! We did CAKE. In Sian Lloyd, the Sick Children’s Trust has a tireless and energetic supporter, who was with us at the launch to encourage us all to get baking, to raise what we could to help families in their time of need. Just £28 can put up a family for the night at one of the houses. This year’s Big Chocolate Tea Party aims to raise £100,000, enough to keep one of the houses open for a full year. Edd Kimber, and a host of other chefs, have come on board to create fabulous recipes to inspire you to get chocolate baking. 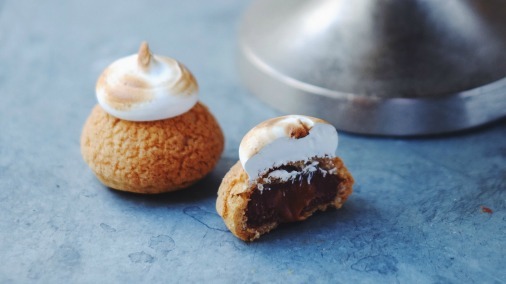 Edd has been kind enough to give me his glorious Smore Choux Bun recipe (which is below, to get you kick started), and made some for us to try that afternoon at Grosvenor House. Thank you Edd! They are utterly divine, and I hope no one caught me swiping the plate from next door’s table. There was no way I was leaving that room while any of those babies remained at large! 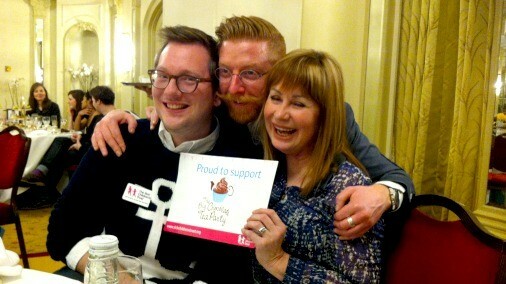 Edd Kimber, Paul A Young & Sian Lloyd, united for The Sick Children’s Trust. If you want to get involved you can email chocolate@sickchildrenstrust.org and ask for a campaign pack, with invitations and recipe cards and all sorts! Or you can go online and read more about it at The Big Chocolate Tea Party. There will also be an auction launching shortly. Many top chefs and pastry geniuses will be making chocolate brownies for you to bid for. 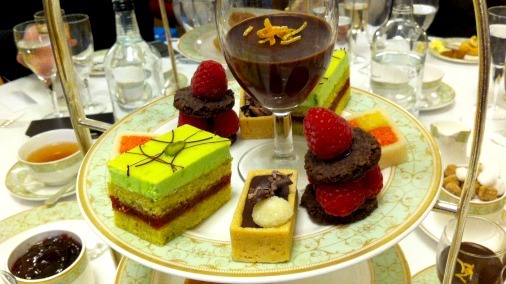 That way you could have celebrity gourmet chocolate treats at your chocolate tea party! So if you want to get your mitts on Paul or Edd’s brownies, keep your eyes peeled. I will include the link here once it is live, and I will be tweeting about it shortly. As, of course, will @BigChocTeaParty. 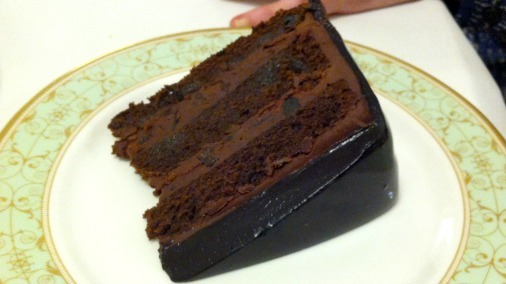 Chocolate and prune cake, in honour of sponsors Valrhona & The California Prune Board. Yes please! So, start thinking what kind of cakes you will make, encourage your friends to join in, and fill your home, school, village hall, book club or poker night with chocolatey (do)goodness. 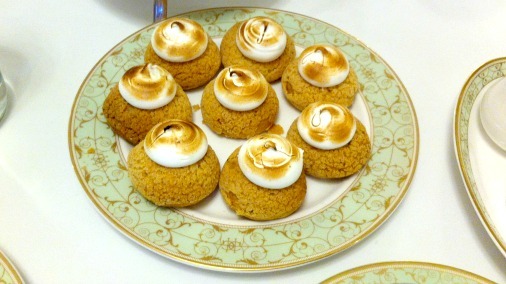 The fantabulous smore choux bun, from Edd Kimber! To make the choux pastry topping place the flour and the sugar into a bowl and mix together. Add the butter and rub together until the mixture resembles coarse breadcrumbs. Press this mixture into a dough and place between two sheets of parchment and roll out until it is about 2mm thick. Place onto a baking tray and place in the freezer until firm. To make the choux pastry place the butter, salt, sugar and water into a medium sized saucepan and place over medium/high heat until the butter has melted and the water is at a rolling boil. Tip in the flours and mix together until it forms a dough. Continue mixing in the pan for about 3 minutes to dry out the dough a little. Dip the dough into a bowl and beat together until no longer steaming. Add the egg a little at a time, beating to combine before adding more. To test if enough egg has been added lift some pastry from the bowl, if it falls from the spoon in a v-shaped ribbon it is perfect, it it tears as it falls add a little more. Place the pastry into a piping bag fitted with a small round piping tip and pipe onto two parchment lined baking trays, in 3.5cm wide rounds. Remove the topping from freezer and using a 3.5cm cookie cutter cut out discs and place on top of each round of pastry. Bake in the preheated oven for 35-40 minutes or until risen and golden brown. 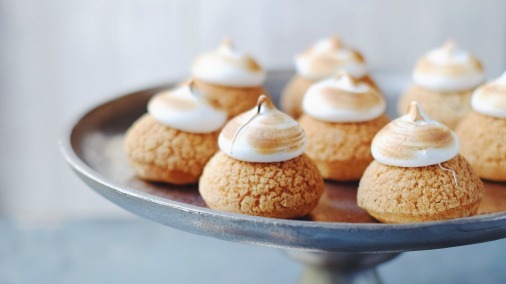 Remove from the oven and use a knife to cut a small hole in the base of each choux bun. To make the chocolate filling place the milk and vanilla bean paste into a large saucepan and bring to the boil. Meanwhile place the eggs, yolks, sugar, cornflour and the cocoa powder into a large bowl and whisk together until smooth. Pour the milk over the eggs, whisking constantly. Pour the custard mixture back into the pan and cook, whisking constantly, until the custard has thickened. Scrape into a clean bowl and add the chocolate, mixing together until melted and smooth. Cover with clingfilm and until cool. To assemble place the chocolate and the speculoos speed into piping bags fitted with small piping tips. Pipe in the chocolate filling until the choux buns are almost full, then pipe in a small amount of the speculoos spread. If you want to take these buns to the next level you can dip into meringue and blowtorch until lightly browned.